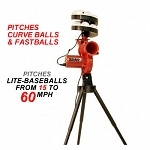 Lite-Ball Pitching Machines • Discount Prices • Free Shipping! Lite ball pitching machines are the perfect practice solution for many people. The balls fly faster than traditional hard balls but do not fly as far after being hit. This means you can work on your bat speed and hand-eye coordination in a smaller space. If you are working with very young hitters who are afraid of the ball, a lite ball pitching machine is an ideal choice. In the unlikely event that they are ever hit with a ball, it won't hurt like a real ball would. This gives young hitters far more confidence at the plate. Keep in mind, however, that a real baseball pitching machine or a real softball pitching machine can also throw lite balls in addition to real balls. Lite ball pitching machines can only throw lite balls. If you want a pitching machine that your child can grow into, it is usually a better decision to buy a pitching machine that can throw real balls and just use lite balls with it in early hitting development. Below, choose from the lite ball pitching machines we currently carry. Additional information about our lite ball machines can be found under the product listings. Work on straight fastballs or changeups and figure out how to hit a curve with the Heater Slider pitching machine. Lite-ball pitching machines aren't just for hitters, either. Whether you want to work on fielding fly balls, grounders or line drives, most of the lite-ball pitching machines can be set up to work on your defense, too. And, of course, if you want a pitching machine that can throw real balls, too, all of our real baseball pitching machines and real softball pitching machines can throw lite as well as real balls.